"What?" you say. "Ducken Hines and The Wacky Quaker?" Yes, indeed. They obsess over the hens. Given access, they are thugs and rapists. And so a while back I separated them. 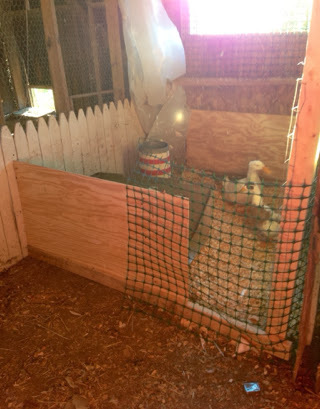 But given the layout of the barn, the divider gave the ducks control of the door to the outside. The hens had technical access, but were forced to run the gauntlet of ducks to get out. 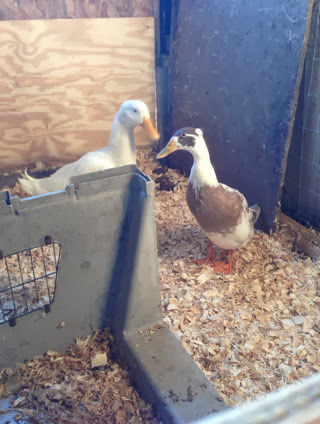 Finally today I fitted out a temporary pen so the ducks could relocate. They were less than thrilled. The chickens, however, were delighted to regain control of the access ramp. Soon I hope to catch photos of the babies outside in the sunshine! Bullies, those hens should gang up on them and whap em with their wings. Glad you worked out the problem. Were the ducks the blip? No, Mary. I lost my job at the beginning of the month. But never fear, there are prospects on the horizon! Looking forward to hearing about the prospects, Johanna. Exciting times.